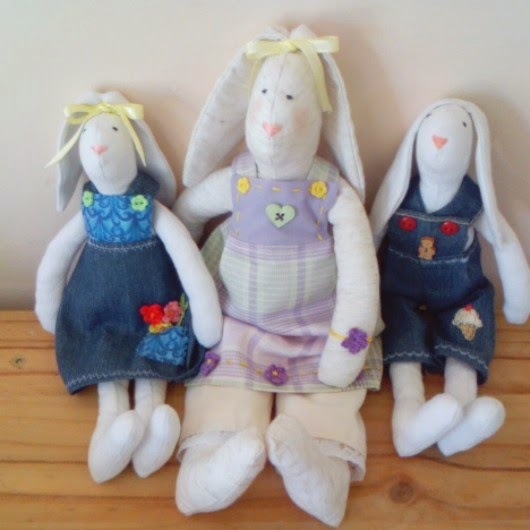 .Linda's Crafty Corner: Something for me. Hello all you lovely people I can't tell you just how much I have missed my blog but finding the time to actually write a blog post totally eluded me for the best part of last year there seemed to be so much going on. I have noticed with sadness that many of our blogging friends have stopped blogging altogether but that is a sign of the times I fear as our lives get busier with the ever increasing demands on our time. 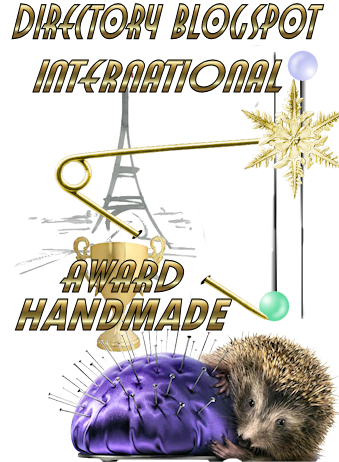 So lets start with what I'm making right now, as you know most of the things I make are made for charity but recently I have been making some things for myself too. I started knitting a sweater a few months ago but discovered that knitting was hurting my elbow😒 I have had problems in the past with aching joints all related to overindulging in my passion for crafting. 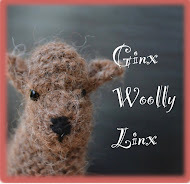 Can you imagine a life without knitting or crochet I'm afraid I can't and will battle on until I can't manage to crochet or knit another stitch. Anyway back to the sweater I decided that moderation is key and so restrict myself to short knitting sessions I'm sure that it will get finished one day. 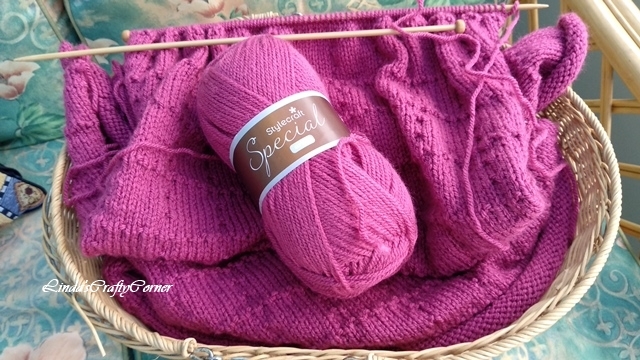 I love the colour of this soft squishy yarn and now I have it I can't let it go to waste and must finish the sweater, luckily this is a basic style that never goes out of date. I have managed to finish a sleeve, the back and am halfway up the front, it's such an easy pattern that I can knit quite easily while watching TV in the evenings I allow myself an hour a day. Luckily crochet doesn't seem to affect my joints as much as knitting does and I have made all sorts over the past year which I hope to show you, but would you believe I'm now making a crochet sweater for myself talk about overindulgence two sweaters for me! I'll tell you all about that one later. What are you starting or carrying over into 2019? What a surprise to see your blog post pop up. I wasn't so great about posting last year either so over the past month have made a concerted effort to do better. Good for you making some sweaters for yourself. I only have a problem with crochet when I use thin cotton and a tiny hook. Have an old thumb injury that gets really painful so that's why I usually stick with an H hook and bigger projects. Need to decide on something to start on. Haven't done much since I made a few small Christmas gifts. Happy New Year! Good for you to getting back to blogging more. That sweater is going to look great! 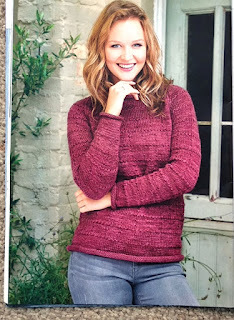 I have a crochet sweater pattern I'm wanting to try. Happy New Year. Hello Linda, so glad you are back! I really mist your stories. The sweater looks lovely, so right you decided to knit this one for yourself. I think, when one is able to make your own clothes, it's much more difficult to buy clothes in stores, since there always seems to be something not right. I have fibromyalgie, and I have to relax and use my muscles alternately. 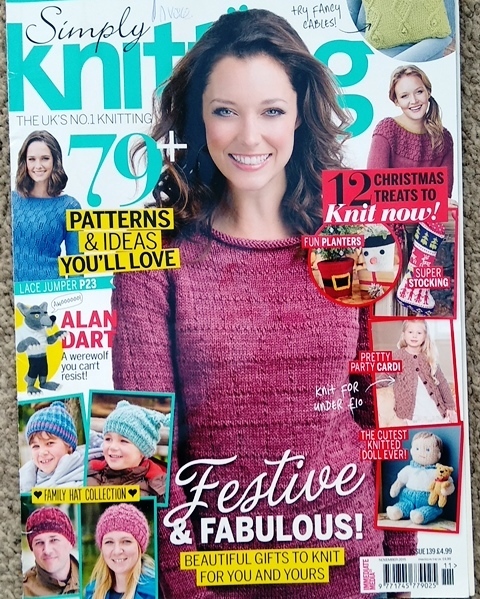 But not knitting or crocheting is something I just can not imagine! Looking forward to your future stories! Hi Linda. Happy New Year. I too haven't been blogging for quite sometime and would love to come back but really don't know what to post. I haven't made anything worth showing. Love the color of your jumper, it's going to be gorgeous. What beautiful yarn! I love the color and can tell it's super soft just by looking at it. My goal is to get back to blogging more consistently, as well. I really understand the whole painful joint thing. I'm experiencing the same thing and have to limit my crafting as you do. Have a wonderful and happy new year! How nice that you are knitting, love the color of your sweater. Sorry to hear that you have pain on your elbow, if you knit a piece every day, it will be ready some day. I am also knitting, just started. Hi Linda, Happy New Year. I am so glad to see you back for a little bit. I love the pretty sweater you are working on. I did some crocheting of hand warmers for my daughter and 5 of her friends recently for Christmas. I can’t seem to figure out what I want to work on next! I hope to be inspired by something soon. Take care. Hi Linda, so lovely to see you. Yes indeed so many have stopped blogging, it is so sad whne you no longer can see how a friend is. Lots of stretching before and during knitting might help. Take you time. Love the sweater. Happy 2019! Great to see you blogging again. I always look forward to your news. I found the same as you when I went through my favourite blogs list. A lot have dried up without warning. I need to make some active efforts to find more blogs to read. 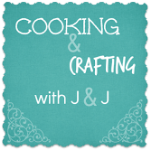 Thanks Linda for joining and sharing at Cooking and Crafting with J&J. Lovely sweater it will look great when it is done! That is too bad about your elbow, but good you will knit and crochet in moderation to be able to continue to craft and also take care of yourself. 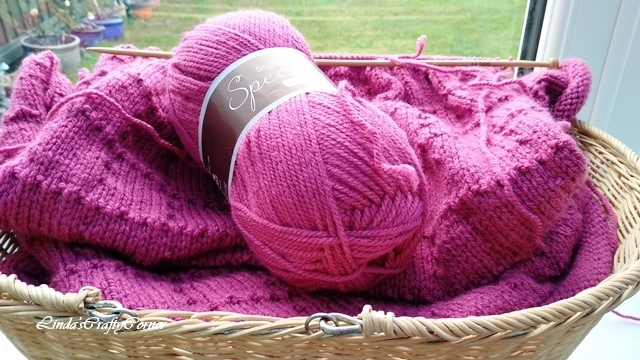 This year I would like to knit a shawl and more projects in general than last year. I have a goal to knit 12 projects all together. Have a great week! How nice to see you back on your blog. Hope to see your jumper when it is done. Yay! It's lovely to hear from you again! 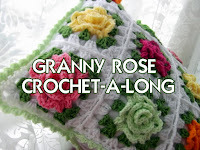 I'm so sorry to hear that knitting is causing you pain, I confess that my wrists ache a little if I crochet for too long but I can get round it by holding my hook differently and not crocheting for long periods of time. I try the exercises that you can find online in the hopes they help. Your jumper is going to be fab, the colour is gorgeous. I have a few really old patterns and books, I think a lot of patterns are timeless so it's well worth keeping old books, a modern yarn with an older patter can look fantastic.